Alexa is Amazon’s voice service and the brain behind tens of millions of devices. These include Amazon devices like the Echo, Echo Plus, Echo Show, and Echo Spot, as well as a growing list of third-party devices with Alexa built-in, like the Sonos One. Customers have already connected tens of millions of smart home products to Alexa, and use their voices to control them millions of times each day. If you build lights, locks, or in-wall switches with Zigbee and certify with the Zigbee Alliance, you can easily add voice control with Alexa, and reach and delight more customers. We introduced the Echo Plus last fall with a goal of making it simple for customers to create a smart home. Echo Plus has a built-in hub that seamlessly connects and controls Zigbee smart devices, such as light bulbs, door locks, switches, and plugs, without the need for separate hubs or apps. Before Echo Plus, the typical customer installation of a smart product with Alexa could require up to seven steps involving both an application from the device maker and the Amazon Alexa application. We simplified this process with Alexa, Echo Plus and Zigbee’s application layer for smart home devices. 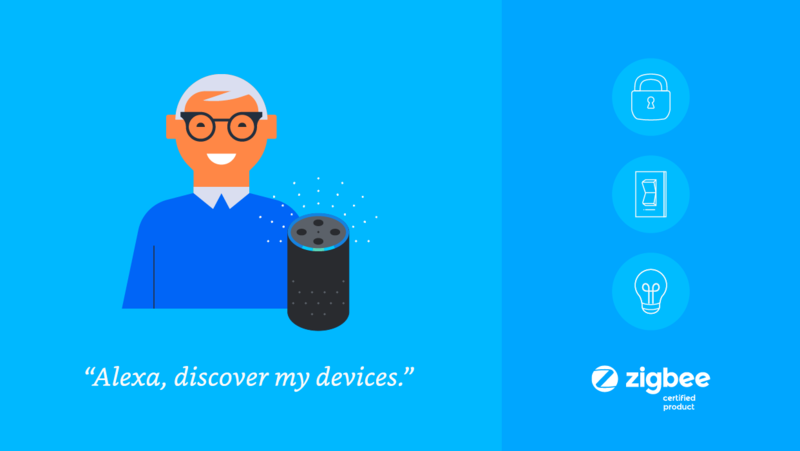 Now, customers can simply say “Alexa, discover my devices” and Echo Plus will discover and setup compatible Zigbee light bulbs, door locks, switches, plugs, and more. This single-step process — which we call “Simple Setup” — reduces complexity and friction for customers and makes it easier for anyone to make their home smart. It also eliminates many of the “points of failure” that can impact the customer experience, as Zigbee devices connected directly to the Echo Plus aren’t reliant on other infrastructure including device maker mobile applications or cloud services. You can connect your Zigbee-based smart devices to Alexa using the Zigbee hub built-in to Echo Plus, or through other Zigbee Certified hubs such as SmartThings and Wink. These options give you the freedom to choose which aspects of a smart home solution you want to build, and the flexibility to support nearly any customer scenario, from those buying their first smart home device to those expanding an existing configuration. Once you’ve integrated with Alexa, your customers can use Alexa’s built-in smart home voice user interface (VUI) to control your smart devices. 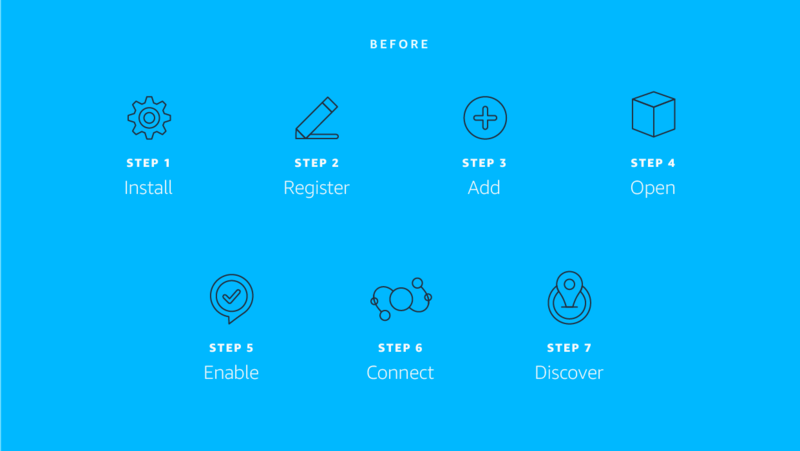 Using this built-in VUI makes your development easier and makes adoption easier for customers. Your customers can also use Alexa Routines and Groups to integrate their smart home ecosystem seamlessly into their homes and daily lives. With Routines, they can trigger a series of actions for one or more devices using a single voice command, or automatically by time of day. With Groups, they can control the devices in the same room as an Echo device without having to remember specific device names. You can certify your Alexa-compatible products through the Works with Alexa (WWA) program to ensure an intuitive, hassle-free experience. Carrying the Works with Amazon Alexa badge also makes it easy for customers to discover your products on Amazon.com. When your products are certified, they can carry the Works with Alexa badge, appear in the Amazon smart home store, and be considered for additional co-marketing opportunities. We recommend that Echo Plus customers look for products that are both Zigbee Certified and certified via WWA. This ensures interoperability between devices, a consistent user experience, and the seamless adoption of your product into your customer’s daily lives. The business benefits of certification are substantial. When comparing the eight weeks before and after a smart device received WWA certification, the average units sold per week goes up by 53%. In addition, we see fewer customer returns when compared to similar smart home devices without WWA certification. To learn more about how to delight your customers with Alexa and how to pursue Works with Alexa certification, visit the Smart Home Development with Zigbee page.